Lionel Place’s family originated from the Yorkshire area and were related to titled gentry gentry in that county, being descended from the Places of Dinsdale in County Durham. A report in December 1818 (when the Castle was offered sale for £30,000) reveals that Lionel Place paid £14,000 for the Castle and grounds and £12,000 for the surrounding farms. Lionel's investment in the Castle didn't end there however, and in 1809 he commissioned the well-known architect Robert Lugar to redesign the Castle, incorporating the old house and making it castellated. The Hall was transformed into a stone-faced building, possibly using Attleborough sandstone, of a similar nature to Arbury Hall. The North and South Lodges may have been built at this time or modified from earlier buildings, and were designed in the Picturesque and Cottage Orne architectural styles which developed in the 1790s. ...the old front [was] altered by making an entrance porch and square tower, carried up to shorten the length of the roofs, and to give character with more accommodation. The south end, also, is carried up to obtain two family bed-rooms, as well as to give more feature. The subordinate buildings are chiefly conveniences to the kitchen: these, together with the gateway, which is the entrance to the stable court, are entirely new. The improvement of the grounds has been effected under Mr. Place's direction who has, by judiciously planting, removing hedges, and altering the roads, produced the most beneficial, as well as pleasing advantages to the demesne." "An adjourned petty sessions was held at Weddington Hall to inspect Roads lately indicted by Rev. Heming and others. Several of the principal people of Nuneaton attended and stated to the magistrates where the bridge formerly stood and where the road went". Subsequent to, and presumably as a result of, this meeting a bridge across the River Anker (Weddington Meadows Bridge) leading from the top of Abbey Street to Weddington was erected and ground raised at Lionel Place's expense on the 2nd January 1818. It was later this year that Place offered the Estate for £30,000, although in the event he only sold a 196 acre farm at Weddington for £13,000. Despite further run-ins with the court (most notably in October of 1818, when he "kicked the posterior of a labourer (Davis) with such force (and the man being ruptured) he was so affected that his life was for some time in imminent danger"), Lionel Place was elected Sheriff of Warwickshire in 1826. He also appears to have been involved, to a degree, in a melee involving the army at a polling station in 1833 - you can read the Leicester Chronicle report here (fourth column along). 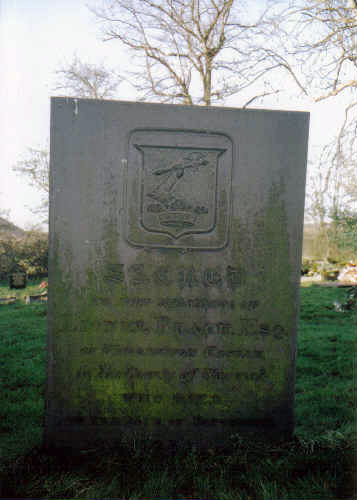 Mr Place died, aged 72, in 1838 and was buried at the nearby St. James' Church, Weddington, with the estate passing to his wife, Sophie. The inscription on his gravestone reads: "Sacred in the Memory of Lionel Place, Esq. of Weddington Castle, in the County of Warwick, who died on the 25th of September 1838." He was survived by two sons: William Henry Place (who later attended Cambridge and went on to the Inns of Court) and Lionel Place. In 2010 the former Grove site was developed as a housing estate of 18 residences, with the Grove itself being divided into apartments - the development was named "Grove Park". The access road from Weddington Road to the development was named "Lionel Close" in recognition of Lionel Place's historical impact upon Weddington.